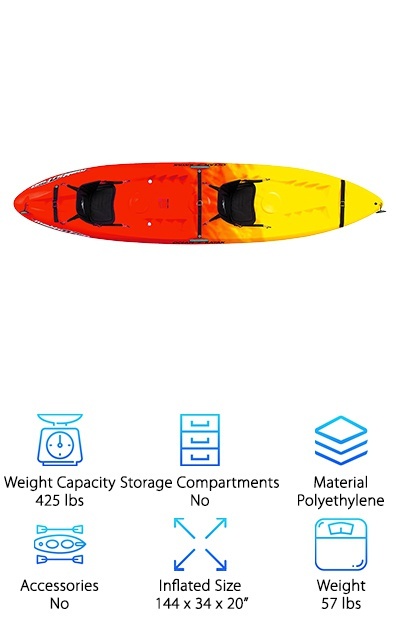 Weight Capacity - How much weight a kayak can take is always important, but especially when you’re talking about tandem kayaks. Make sure to account for your weight, your friend’s weight, and any gear you’re bringing along to stay safe. Storage Compartments - We were genuinely surprised by how many different storage options are available. 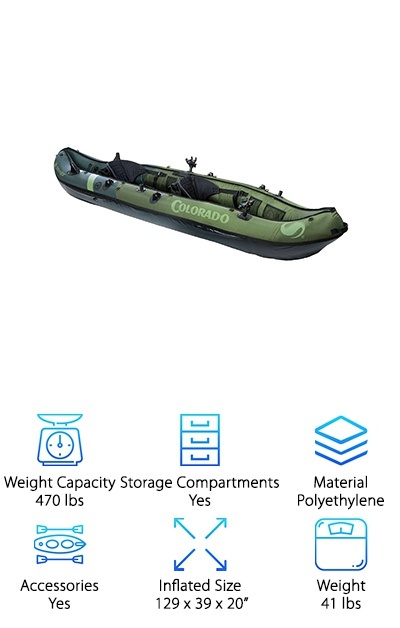 You’ll find bungee netting, mesh pockets, and even locked compartments where you can keep your valuables safe and dry while you’re out on the water. Material - Materials vary a little but are all strong and durable. Make sure to get one that’s resistant to punctures and UV light. 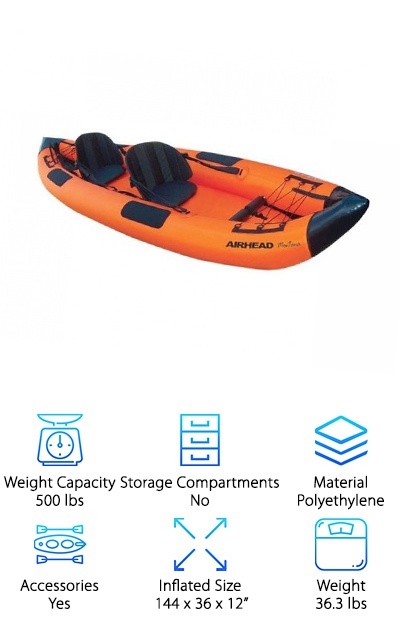 After all, every time your kayak is out on the water, it’s exposed to the sun. 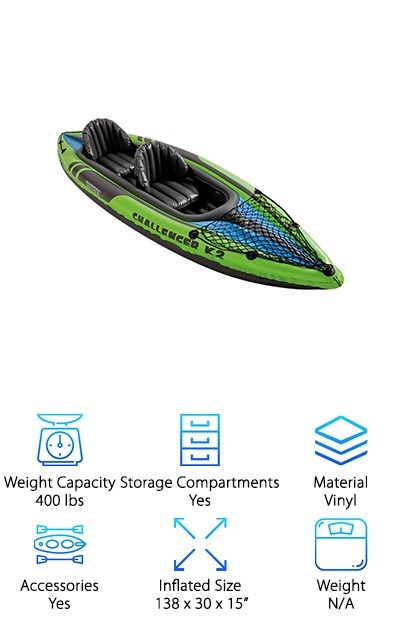 Accessories - If you’re going for an inflatable kayak, getting one with a pump included is nice because that’s one less thing you’ll have to get. 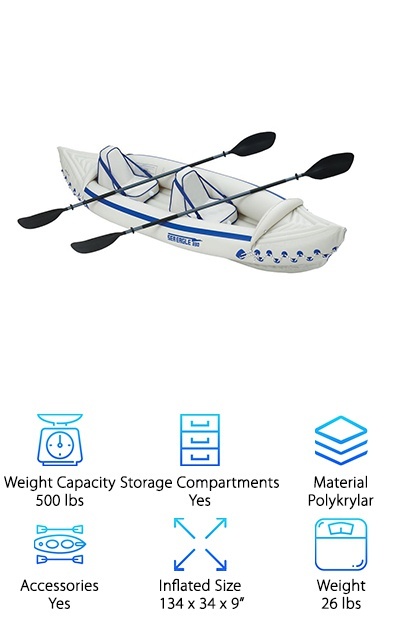 You’ll also find some that include oars, patch kits, and comfortable seat backs. 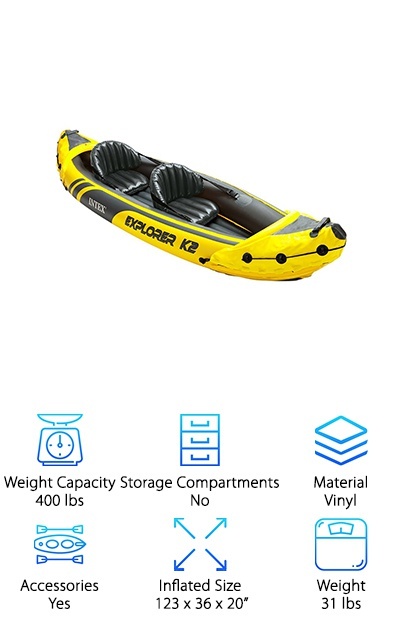 Inflated Size - When you look at an inflatable kayak when it’s deflated, you won’t be impressed. But once you’ve pumped it up, they can be pretty big! Believe it or not, some are as much as 12 feet long! 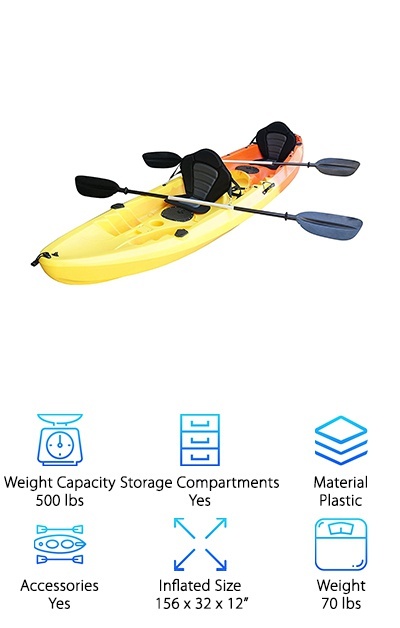 Weight - It’s important to remember that, at some point, you and your kayaking partner are going to have to carry it from the car to the water and back again. Luckily, most of them are light enough that it’s not a problem. 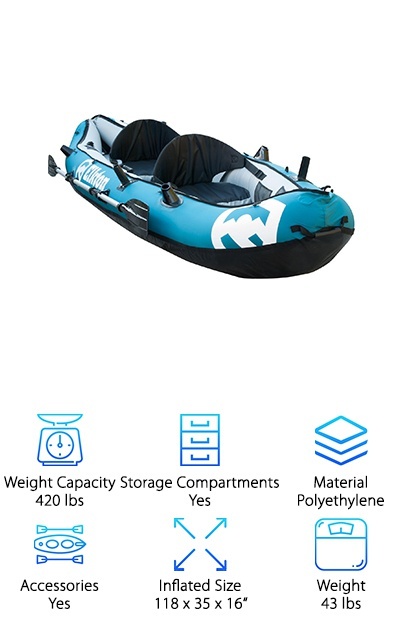 For a tandem kayak that’s comfortable enough for you to spend hours out on the lake fishing or just relaxing, you can’t get much better than this one from Nixie Sports. Paddling is almost effortless and the backrests are exceptionally comfortable. 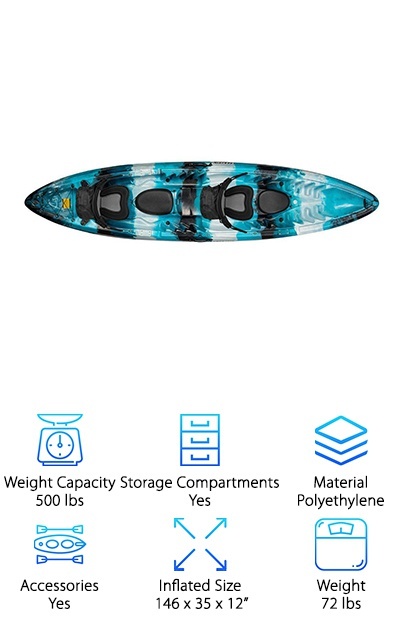 There’s also plenty of room on this best tandem fishing kayak to store your supplies for the day. It comes with bungee straps and even has cup holders. And get this - there’s a lockable hatch where you can store your valuables. 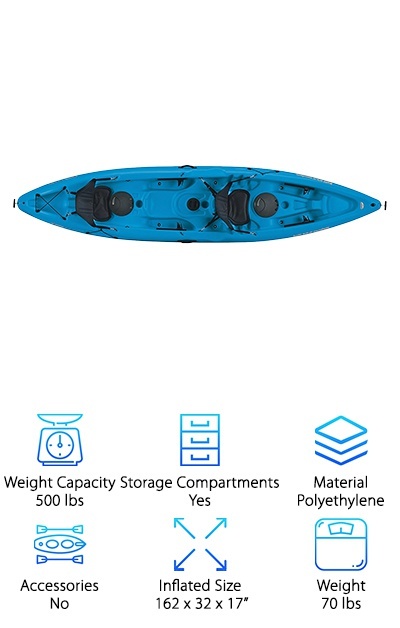 It has 4 flush mounted fishing rod holders and multiple foot rest positions so you can make sure you’re comfortable while you’re waiting for the fish to bite. They even offer a 3 year hull warranty, which to us shows that stand behind the quality of their product. Sometimes when a product looks cool, it’s at the expense of performance. But that’s not the case with the Intex Challenger K2. Not only does it look sporty and fun, it’s also built tough and performs well. It’s made of Intex’s special rugged Super Tough vinyl. What’s so special about it? It resists punctures and damage from UV light. It can also take scrapes and bumps like a champ. It includes a nice set of accessories as well, including two oars, a pump, and a patch repair kit. It’s easy to maneuver and has easy tracking so you’ll be able to get exactly where you’re trying to go. The I-Beam support provides added stability so you get a nice, solid ride. One last thing, it has a small bungee storage area on the front, too.